Leadership and Nursing research papers discuss how, times have changed and evolved to put the nurse in a key position of leadership in today’s healthcare systems. Leadership and nursing go hand in hand. While many decades ago, the nurse practitioner was not looked upon as a leader, times have changed and evolved to put the nurse in a key position of leadership in today’s healthcare systems. 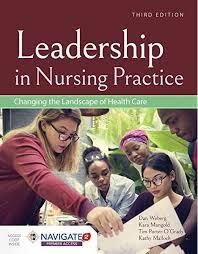 A major portion of nursing programs in the United States focus on leadership and nursing due to the importance of developing leadership traits in nursing professionals. A good portion of nursing curriculum deals with business practices that could be taught in any MBA program. Nurses are burdened with leadership courses in order to assist them in developing into the maximum achievers that are needed to lead today’s healthcare facilities. Identify and removing obstacles that occur at the point of service. As the link between system and patient, nurses are often the deciding factor between high-quality care and a bad experience for patients. Because effective leadership is often key to successful nursing practice, many theorists have analyzed nursing leadership styles to determine the ideal elements for the best possible leadership. Although these theories are rarely in agreement, they offer insight into alternative leadership styles and provide nurses with methods that can be used in typical practice settings. The three classic leadership styles are authoritarian, democratic and laissez-faire; each operating just as its name suggests. Potter and Perry note that there is no single best leadership style, but the effectiveness of each depends on the situation. Effective nursing management is characterized by the ability to get others to perform, whether they are patients, colleagues, aides, or others in the practice setting. Staff nurses, for example, are responsible for the management of relations with patients and their families, which requires graceful management skills. This aspect of nursing management is very important because it often creates the image the public perceives of not only the entire nursing staff, but also nursing practice in general. One of the most oft studied leadership theory is that of situational leadership. Situational leadership is characterized by the nurse evaluating the current climate, factors and environment of a situation and then taking a leadership role that is the best theoretical match for the issue at hand. This form of individualization of leadership style allows the nurse to apply the level of care needed to exactly what the patient or staff member will respond to. By developing situational leadership skills, the nurse is maximizing the level of use the organization can get from him or her individually. Furthermore, the more experience a nurse has, the better at applying situational leadership skills to an organizational or healthcare setting. While it may be frustrating for the nursing student to have to engage in many business and leadership courses and practice; this type of services is demanded in today’s healthcare facility. If your nursing course load is too heavy, look to Paper Masters to assist you with the course work you need help with – particularly the difficult and broad topics such as leadership and how it applies to nursing. Nursing Ethics Issues - Nurses find themselves caught between their ethics and the mandates of managers and leaders in healthcare organizations and even in insurance corporations. Definition of Leadership - Definition of Leadership research papers discuss the basic functions of leadership in a business setting. Leadership Philosophy - Leadership Philosophy Research Papers examine an order placed for graduate level services on the leadership skills for a manager of a company. Nurse as Patient Advocate research papers for nursing students are custom written.